The show today was to start at noon. We would be picked up at 10:30. I got up at 7:30 and walked to a Starbucks I had noticed that was closer than the one at St. Peter’s Square I had found the day before. This one was on Oxford Road just past the big BBC building. My plan was to post a report on my blog. The only rub was that in British Starbucks there was no free WiFi except for people who had Starbucks cards. My card, not being of use in Germany, Switzerland, Finland, or Denmark, was back in my suitcase and I didn’t have a key to get back into the house and certainly wasn’t going to knock on the door and wake up John who apparently was a night owl. I also didn’t recall my user name or pin code. Just how many of those for different purposes does one have? Luckily one of the Starbucks employees volunteered the use his id and pin number and I was in business. At MMU we parked on the street. I took one handle of the metal box and Paul took the other and we got the behemoth into the building. We took it into a room that had tiered seating in a half circle and a large screen at the front. 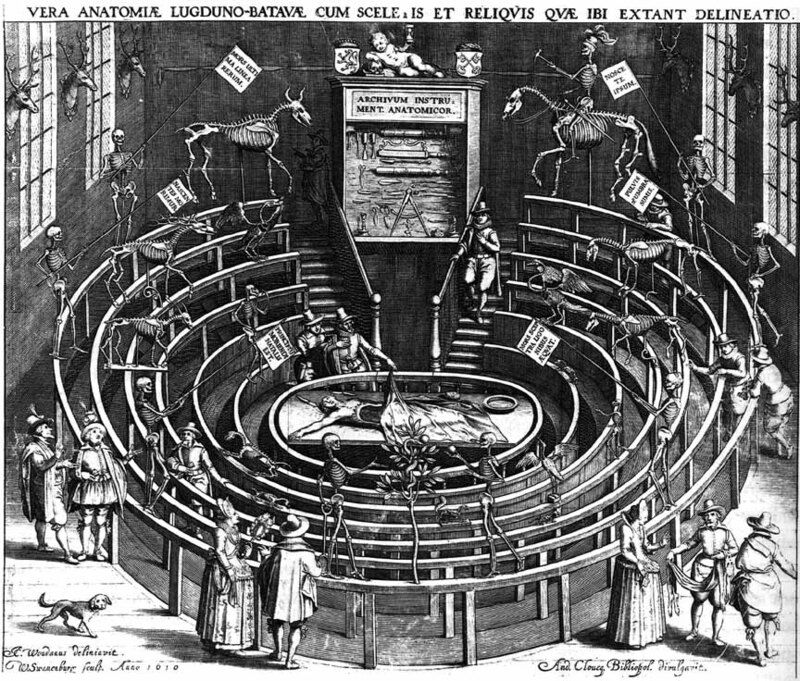 It was the modern equivalent of the anatomy and dissection theaters that were in British medical schools a hundred years ago. You can see a good example of that in 1931 version of Frankenstein. The reason we had an hour to set up was that we were going to patch the 16mm sound into the room’s audio system and were not sure how compatible they would be. It turned out they were not compatible at all. Luckily the show time was actually 12:30 and it was only shortly after that when they finally got the projector to speak. The show was going to be me, John, and a woman named Marian Hewitt. It was a sort of mini-symposium on film archives and animation. John had a collection of 16mm films himself. Marian was the director of the North West Film Archive. I would lead off with the subversive animation show. About 20 students were in attendance. I gave the same talk I had given in Preston. The films ran fine. There were a few questions afterwards. We then had a break. Outside the room there was coffee, tea and Walker’s Shortbread cookies. 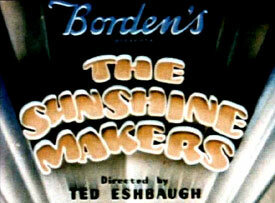 One of the students told me that the cartoon The Sunshine Makers was on line with a hip hop sound track added. That was interesting news to me. Marian was next. She explained that their archive was for films from the region and there wasn’t much animation in the collection. She had brought three items on DVD. First was a neat six minute silent infomercial for Telegraph Soap from 1921. It was a mix of animation and live action and also had scratching on the film effects. The plot was about a man sent over telegraph wires to a washer woman’s station where he used the soap he’d brought along to make her life easier. He also knocked her around a bit for no apparent reason. The scratching on the film was used to produce the look of lightning bolts coming from his finger tips to aid in the washing. Her next was a film from 1947 using a jazz soundtrack to promote a local trade union and the local cotton industry. It was also very interesting. The final one was early work by the local animator Paul Berry who had worked with Tim Burton and also made the Oscar nominated 1991 film The Sandman . One of the Berry items was a trippy film he made when was a teenager using the Red Riding Hood story. John showed two examples of Hungarian animation. One used line drawing and the other was puppet animation. The puppet animation was a very well done story about a puppet that went to a school for clowns. It had no dialogue which meant it could be shown in any country without the expense of subtitles or dubbing. It also had great color. A really cool film. We drove straight to the house instead of taking the projector back to the Green Room. We would need it for the Wednesday show there, but John wanted to work on it first. Paul, who was member of the Kino Film group, came in and we talked for an hour or so. Paul then gave John a ride to the post office so he could mail out a bunch of heavy packages. I stayed at home and wrote up a second blog report. If I could get it posted I would be just a day behind. If I could post two more reports the next day I would be caught up. There was a meeting of the Kino Film group at 7:00. It was held at the nearby Odder Bar. I went along. The Odder Bar has free wifi. While John met with three members of the group I had a pint and got the report posted. 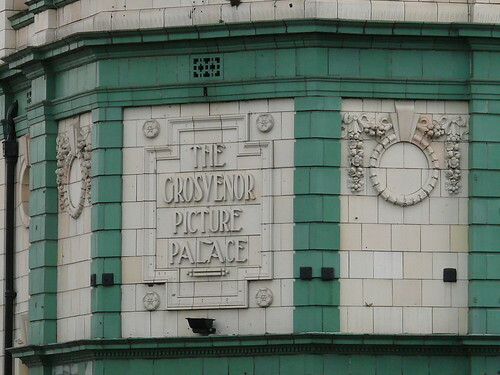 On the walk back to the house we stopped to look in the windows of the Grosvenor Picture Palace which is right on Oxford Road. 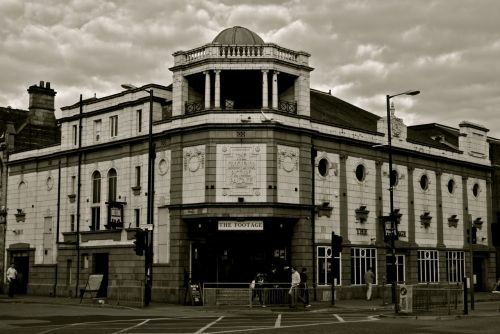 It is an ancient looking movie theater that looks nothing like anything ever produced in America. The outside was all done in green and off white titles. The building was landmarked. Through the window I could see a wrap-around balcony and the original ceiling. Very ornate and Victorian looking. Instead of a movie screen there was a huge video screen with a soccer game on it. John said it was not the sort of place you would ever go into as you wouldn’t be welcomed there. It was a student bar with really cheap drinks. I asked if they’d beat you up if you went in. He said no, nothing like that, although they might throw up on you. We then went home where John made falafel plates for dinner.